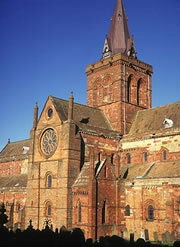 ST MAGNUS CATHEDRAL is one of Orkney's most magnificent landmarks - towering above the Kirkwall landscape with its distinctive red sandstone hues. Work began on construction of the 'finest church the North had ever seen' in 1137, and it now belongs to the 'people of Kirkwall'. Please select a main category below, from which to explore further. You will then see a listing of individual topics - click on the topic link you wish to view. This resource was developed as part of the Resources for Learning project funded by the New Opportunities Fund Digitisation Programme. Further resources and 70,000 objects can be found on the RLS site.